What do Reebok shoes, fuel and disposable forks have in common? All can be made from biorenewable sources instead of petroleum. This fall, the College of Natural Resources welcomed undergraduate students and teachers as part of a new program aimed at cultivating the next wave of industry leaders by promoting undergraduate career readiness and providing professional development for rural high school science teachers, so that they can, in turn, inspire underrepresented high school students to discover the bioproduct and bioenergy industries through high school lessons and career fairs. This semester marks the official start of the USDA-funded Sustainable Bioproducts and Bioenergy Program (SBBP). A collaboration between the College of Natural Resources and the College of Education, SBBP aims to provide diverse undergraduate students and high school teachers with interdisciplinary knowledge and skills needed to advance the bioeconomy, an economy based on renewable bioproducts produced from plant materials rather than petroleum. The inaugural class includes nineteen high school teachers from eastern North Carolina and nineteen undergraduate students representing eight different colleges and universities around the state. 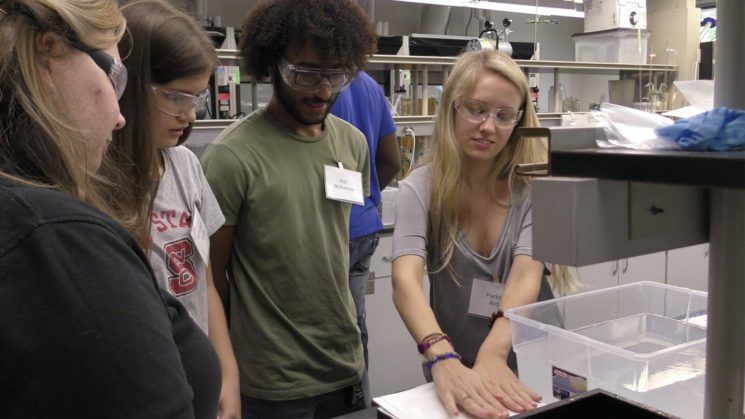 Participants kicked-off the program with a visit to campus where they were guided through hands-on lab activities such as de-inking wastepaper through a flotation technique to demonstrate the importance and challenges of recycling; and investigating the enzymatic digestion of starch by amylase, a process that has important applications in biofuel and bioplastic production, reducing our reliance on fossil fuels. As part of the program, high school teachers will complete two online courses and two one-week professional development workshops that will help them create new lesson plans and coordinate annual bioproducts and bioenergy career nights at their high school. The undergraduate students will complete one online science course per semester, for a total of 9 transferable credit hours. They will also complete one paid internship arranged by the College of Natural Resources with a company participating in an industry, government or research partnership.